Existing conditions such as in a Cathedral can create wonders in interior design. 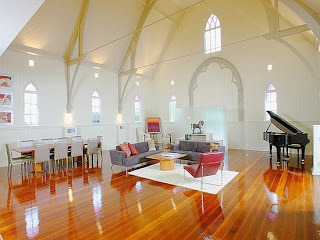 The architectural elements and tall windows helps to create a beautiful and elegant conversion from a cathedral to a home. I absolutely love the drama of this space! The mix of contemporary with traditional works so nicely.